Video surveillance is a practical security measure for almost every environment! Anywhere that the safety of customers, staff, patients, or business assets is valuable should be armed and protected against potential hazards or theft. Moreover, 50% of facilities such as banks, malls, restaurants, hotels, etc. use VHS or 1st generation digital surveillance today, even though their premises are already wired for advance digital surveillance. Upgrade or add a system tailored specifically to your premise’s needs. Depending on your system needs, and specifically the type of surveillance cameras you have or desire, there are several suitable different DVRs. Our IP DVRs, such as the Clear2there IP Series line, are designed for seamless compatibility with IP surveillance cameras, while analog DVRs, such as the Clear2there 1000 Series, function with analog cameras. However, additional transmitters are available to convert IP to analog and back if needed. Like the IP cameras, IP DVRs easily integrate into data systems and eliminate any picture distortion with high definition. 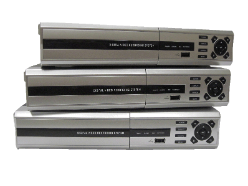 The analog DVRs, such as the 1000 Series, are a lower cost than the IP DVRs, and excel with low lighting analog cameras. In addition to analog and IP, ICON Voice Networks offers hybrid DVRs, such as the HDVR Series and the 8400 DVR of the 8000 Series. 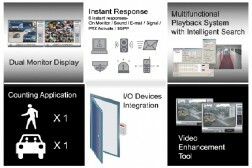 Hybrid DVRs are compatible with both IP and analog cameras without the need of an additional transmitter – a perfect solution for an integrated system of analog and IP cameras.